The development of atomic force microscopy (AFM) and scanning tunnelling microscopy (STM) with functionalized tips has allowed the visualization of molecules adsorbed on different surfaces with submolecular resolution. This key advance, together with the possibility of inducing on-surface chemical reactions with the tip of the microscope opens up exciting applications in chemistry and materials science. Our group at CiQUS is specialized on the synthesis of large aromatic molecules by solution chemistry. 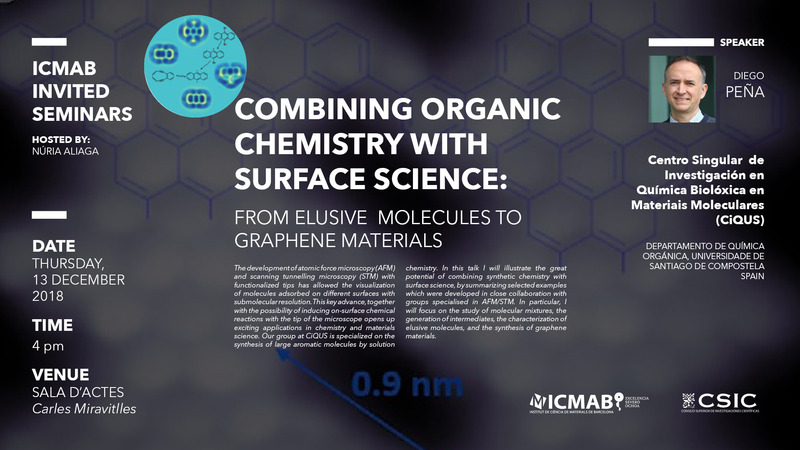 In this talk I will illustrate the great potential of combining synthetic chemistry with surface science, by summarizing selected examples which were developed in close collaboration with groups specialised in AFM/STM. In particular, I will focus on the study of molecular mixtures, the generation of intermediates, the characterization of elusive molecules, and the synthesis of graphene materials.